Visualizing your dream vacation just got easier with the introduction of “Place Pins” by Pinterest. Pinterest boards around travel were already quite common throughout the social medium. Place Pins are just an improvement with a more finished approach. Pinners can create travel focused Place Boards with the help of Place Pins on an interactive map. Apart from the maps, Place Boards can include images and other relevant information like addresses and phone numbers. Place boards combine visual imagery with the usefulness of placemarkers on a map. Creating a Place Board starts with adding a map to a new board. Then, you can use Place Pins to add your favorite spots on the map. The Place Pins are placemarkers and clicking on them brings up the connected photo and information on the right. You can also easily edit an existing board and add a map. Collaborative boards can be created with a bunch of friends or family, and you can also share a board with any friend who is planning a trip to the place on your Place Board. 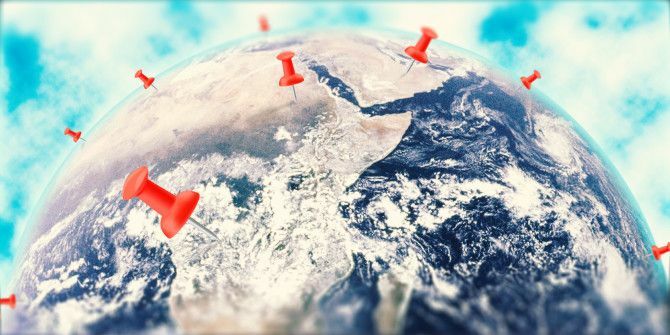 The new Pinterest Place Pins uses Foursquare’s location API, and Mapbox’s mapping technology. Travelers on the move can use the mobile app to track their journey. They can also use a Place board to chronicle their route. The information on the map also serves as a visual aid to ask for directions from the locals. If you are short of inspiration, check out some of the beautiful Place Boards curated on the announcement post. Add your own and tell us how you see yourself using Place Pins on Pinterest. Explore more about: Pinterest, Travel. I have a board, Places I Would Like to See in Person, and I tried using Place Pins with it. My experience was frustrating. The place I wanted to see on the map was a huge cave in Vietnam. I had the name of the cave and the country, but Place Pins came up empty. When I tried to start over, using just 'Vietnam' as a beginning, I got a ton of nudges to pick from various Vietnamese restaurants in the U.S. rather than anything in Vietnam. Needless to say, I removed Place Pins.